Size: 355 x 495 mm with wide margins. Amsterdam: Hondius, 1609. 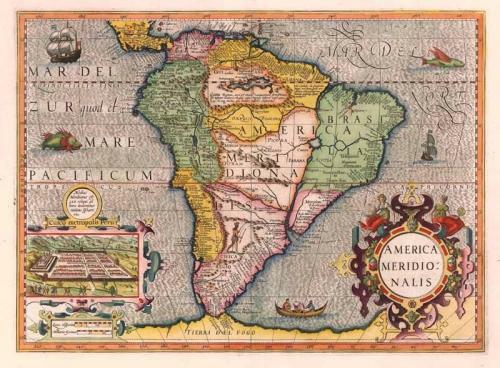 A double-page engraved continental map of South America from the first French edition of Mercator's Atlas sive Cosmographicae. The Strait of Magellan is show but Tierra Del Fuego is part of the large southern continent. Eastern Brazil is depicted as an island, made insular by a huge Rio de la Plata that extends from the Atlantic in the south to a large lake, Eupana Lacus. From this lake the Rio Grande flows further northward into the Amazon river and from there into the Atlantic. In an inset there is a view of Cusco, the Inca capital. The map has Latin text on the verso. It is in very good condition and is a stunning period map.